After years of working for the same River North hotel, 28 housekeepers lost their jobs on an otherwise normal Tuesday in September. 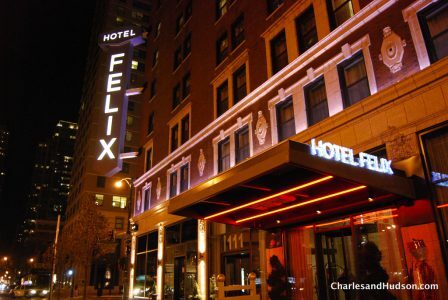 Many, like Rosa Rauda, had worked at the Hotel Felix since it opened on Clark and Huron in 2009. Others, like Miriam Barreria, had worked at the boutique brand for a few years. On Monday, Sept. 25, “everything was normal,” said Rauda through a translator, Alejandro Monzon for Unite Here, a national hospitality union. “From one to the next, what happened was by surprise,” she said. “They were put in a situation where their livelihoods were all of a sudden in a crisis,” said Monzon. Oxford Capital Group, which owns Hotel Felix and more than 30 properties in nine states and Japan, could not be reached for comment despite repeated efforts. Over the past four years, the development group has opened several boutique hotels in Chicago, including LondonHouse, The Langham and The Godfrey across the street from the Felix. There, Unite Here, which represents thousands of hospitality workers in the United States and Canada, petitioned housekeeping department employees to organize in September. Of 35 eligible part-time and full-time employees, 26 voted to join Local 1. The Godfrey vote was certified by the National Labor Relations Board (NLRB) on Sept. 25 — the day before the Hotel Felix housekeeping staff was fired. The Felix workers were not Local 1 members. According to Monzon, friends and family who knew members of the union encouraged the fired employees to explore their options. On Nov. 2, Unite Here filed a wrongful discharge complaint against Hotel Felix and Oxford Capital. The complaint also alleges the hotel refused to hire prospective workers, claiming they were “salts” — the organized labor term for employees seeking a job for the sole purpose of organizing the company’s non-union workforce — within the hotel. The lawyer for Unite Here, who filed the labor complaint, could not be reached for comment. Professor Robert Bruno, the labor program director at the University of Illinois at Chicago, said Unite Here could have been communicating with the Felix workers about organizing, but he said, “it could just be workers coming together and trying to get their employer to treat them more fairly.” By helping the displaced workers, he said, the union “becomes an active consideration,” encouraging support for unions down the road. Monzon and Unite Here first helped the Felix workers organize a protest outside the hotel on Oct. 19, the union’s national “mobilization of service industry workers.” day. 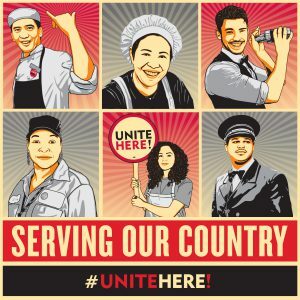 On its website, Unite Here advertised the day’s events with the motto “Serving Our Country” in bold letters alongside illustrated images of bartenders, cooks, hotel porters and housekeepers. “They are organizing to get their jobs back,” said Monzon at the time. After a trip to California in early September, Rauda’s manager asked her about her family, whom she had visited last-minute. Everything seemed normal. “It was like there were no clues really,” she said later. Barreria had recently requested to take a Saturday off. The reply: sure, take any day off you want. On that last Monday in September, Barreria, Rauda and their colleagues noticed an addition to their schedule: a mandatory 2:30 p.m. meeting on Tuesday. They also noticed an error, or possible omission. Most of them were not scheduled for Wednesday, Thursday, Friday or the rest of the week. Of course, they thought it odd, but continued with their Monday routines — Barreria and Rauda returning home on their typical half-hour CTA commute and back to the hotel on Tuesday morning. It was a normal work week. At 2:30 p.m. on Sept. 26, the 28 housekeepers convened in their locker room, waiting for one of the hotel managers and a human relations representative to speak. Collect all of your belongings and clean out your lockers, they were told. We are letting you go. Reached by phone in November, Sarah Helmus, front office supervisor at the Hotel Felix, would not comment on the details of the Sept. 26 exchange. She also declined to comment on why the workers were terminated without reason or warning. “It wasn’t cordial at all,” said Barreria. “There were tears, anger, sadness, all kinds of reactions,” she and Rauda explained through Monzon’s translation. “That was the end,” said Rauda. They were told to leave the hotel immediately. They left humiliated, they said. In the haze of the few minutes between mandatory meeting and abrupt dismissal, Rauda left a pair of shoes behind. When she returned to the hotel a few days later to retrieve them, she was told they had been thrown in the trash. “It feels like they don’t want to have anything to do with us,” she said. Bruno agreed that whether the employees were on the brink of organizing with Unite Here is irrelevant. The National Labor Relations Act (NLRA) protects “acting for mutual aid,” and the complaint Unite Here filed on their behalf was the first step in perhaps proving that case. When asked what they said to one another after receiving the abrupt news, Rauda and Barreria responded quickly. The two women said they earned about $17 per hour at the hotel, higher than the national average wage for housekeepers of $11.46 and the regional average of $12.81, according to the Bureau of Labor Statistics. The greater Chicago area employs about 21,000 housekeepers and maids, less than only New York, Las Vegas and Los Angeles. Felix’s pay rate coincides with higher earnings negotiated after a high-profile bargaining session between Unite Here and Hilton in 2006. Employers follow that rate predominantly as a “union avoidance technique,” explained Bruno. “They would rather pay a little bit more because they don’t really want to have to deal with power sharing. They don’t want workers to have a collective voice.” It also more closely matches the average housekeeper wage in top-paying cities like San Francisco, Honolulu and New York. Bureau of Labor Statistics 2016 data estimates that Hispanics and Latinos fill nearly 50 percent of the country’s 1.5 million maid and housekeeping jobs. Fearing that an organizing campaign could start, said Bruno, the hotel might have acted preemptively to prevent the possibility. Sometimes employers fire one outspoken activist to cause a chilling effect: “Keep quiet or quit.” But he said it’s not rare that an employer would fire groups of people at once, especially workforces primarily comprised of recent immigrants or non-English speaking workers. More than two months since that Tuesday in September, Barreria, Rauda and their former colleagues are looking for work.